Biomedical research at UBC is expanding and part of the burgeoning development of biotech in the Pacific Northwest region. The department’s goal was to improve facilities for existing faculty and students and also create a vibrant and contemporary space to attract the best of new recruits. With their renovations, the department sought to improve facilities..
University Services Building, The University of British Columbia The client, UBC Risk Management Services, recognizes that the health and well-being of employees is a worthwhile investment that pays significant dividends in terms of staff satisfaction, retention, productivity and the reduction of absenteeism. 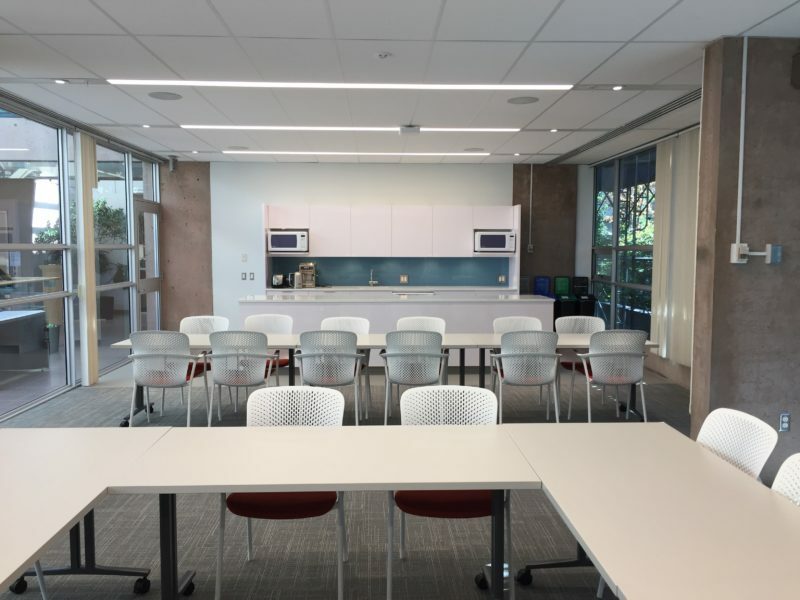 This project on the Vancouver campus is a 4,000 square foot tenant improvement..
Architects: Hotson Bakker Boniface Haden Architects (Andrew Larigakis role was as Project Architect for HBBH. He was involved from the early design phase through to completion of construction). http://www.canadianarchitect.com/news/quest-for-the-future/1000228600/ Cost: $60 M Completed 2007 Quest University is the first private, non-profit and non-secular liberal arts and sciences university in Canada. The campus.. The University of British Columbia, Vancouver, BC Architects: DIALOG and B+H Associated Architects (Andrew Larigakis is the Project Architect for this project. He has been involved from the early design phase through completion of construction). http://www.dialogdesign.ca/projects/ubc-student-union-building/ Cost: $103 M Completed 2015 The new AMS Nest (Student Union Building) is sited adjacent to the existing Student..
British Columbia Institute of Technology Architects: Hotson Bakker Boniface Haden Architects and Cornerstone Architecture associated architects (Andrew Larigakis role was as Project Architect for this project. He was involved from the early design phase through to completion of construction). http://www.dialogdesign.ca/projects/bcit-gateway/ Cost: $32 M Completed 2011 The BCIT Gateway Project was developed..
Squamish, BC Architects: Hotson Bakker Boniface Haden Architects (Andrew Larigakis role was as Project Architect for HBBH. He was involved from the early design phase through to completion of construction). The 50,000 square foot Academic Building is an unconventional structure designed specifically to suit the needs of Quest University’s unique program. With class sizes capped..
Squamish, BC Architects: Hotson Bakker Boniface Haden Architects (Andrew Larigakis role was as Project Architect for HBBH. He was involved from the early design phase through to completion of construction). The new 45,000 square foot Library building also acts as a welcome centre and houses administrative offices, a bookshop and cafe. As the formal front door..
Revelstoke, BC Architects: DIALOG (Andrew Larigakis was lead designer with DIALOG for the winning competition entry and schematic design) http://www.myvirtualpaper.com/doc/Award/award_feb12_cwm59271/2012020101/75.html#74 Cost for Elementary, Secondary Schools and Site works: $47 M The new Secondary and Elementary schools were born out of a design competition which was won by a team including DIALOG and Graham Construction. The..
Revelstoke, BC Architects: DIALOG (Andrew Larigakis was lead designer with DIALOG for the competition-winning entry and schematic design) http://www.myvirtualpaper.com/doc/Award/award_feb12_cwm59271/2012020101/75.html#74 Cost for Elementary, Secondary Schools and Site works: $47 M Revelstoke Elementary School is a focus for learning for both school age and pre-school children as it houses a uniquely successful Strong Start program that prepares..